Stratasys, Ltd.: Are MakerBot's New Composite Materials a Game-Changer? At the 2015 Consumer Electronics Show, Stratasys&apos; MakerBot debuted a line of PLA plastic composite materials for users to 3D print objects with a more realistic feel and take on new properties. Later this year, fifth-generation MakerBot owners will be able to 3D print objects in limestone, maple wood, bronze, and iron PLA composites.According to Anthony Moschella,MakerBot&apos;s vice president of product, materials are the next frontier in 3D printing, and as new materials become more mainstream, it&apos;ll openup new use cases for the technology. More than a plastic trinketA major benefit in using 3D printed composites is that composite-printed objects don&apos;t feel like cheap plastic trinkets and feel more like things of value. What&apos;s more, 3D printed composites take on some of the properties of whatever material has been added to the PLA plastic. For instance, MakerBot&apos;s iron-based composite has magnetic properties and its wood-based filament can be sanded or stained -- both of which could help expand the use cases of its consumer-oriented 3D printers. 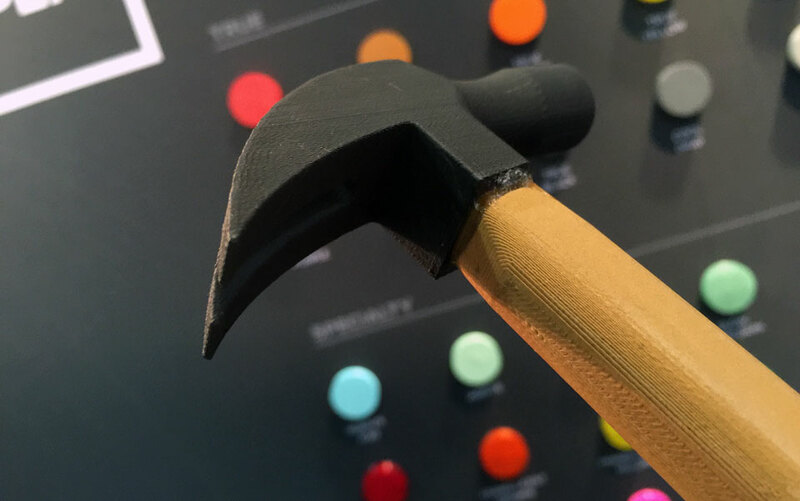 In terms of feel, Engadget explained that a 3D printed hammer made from MakerBot&apos;s maple and iron composite filaments has a similar feel to a real hammer, but the composite iron is not quite as cold as a real hammerhead would be, and the hammer itself feels lighter -- but not as light as a plastic one. Where this is goingFrom a business perspective, expanding 3D printing&apos;s use cases expands MakerBot&apos;s market opportunity, and also helps the company remain differentiated in the sub-$5,000 marketplace, which is expected to be a significant driver of unit growth -- and competition -- in the coming years. The use cases for MakerBot&apos;s composite materials stretch far beyond the consumer-oriented segment, thanks to the properties they take on and the company&apos;s intention to bring additional composite materials to market in the future. Ultimately, Moschella believes that artists, educators, engineers, and product developers, could all benefit from using MakerBot&apos;s composite materials. During an interview with Engadget, Moschella highlighted that engineers in MakerBot&apos;s research and development labs have even used its iron composite filament to 3D print inductor coils for transformers and parts for motors. The bigger picture Although composite filaments aren&apos;t an entirely new concept in 3D printing, MakerBot represents the first major company to embrace composites with enough resources to change the commonly held belief that entry-level 3D printing is a gimmicky technology. Putting it all together, MakerBot has the potential of using composite filaments and its brand exposure as a way to make 3D printing a more valuable and accessible technology in the eyes of potential users. Talk about a potential game-changer for entry-level 3D printing. The article Stratasys, Ltd.: Are MakerBot&apos;s New Composite Materials a Game-Changer? originally appeared on Fool.com. Steve Heller has no position in any stocks mentioned. The Motley Fool recommends Apple and Stratasys. The Motley Fool owns shares of Apple and Stratasys. Try any of our Foolish newsletter services free for 30 days. We Fools may not all hold the same opinions, but we all believe that considering a diverse range of insights makes us better investors. The Motley Fool has a disclosure policy.